Your Next Stamp 14 Days of Holiday Fun~Day 8! Hello! Today Karen is releasing some Holiday Minis~CUTE!!! I just love the little mini stamps~especially for tags! I made a tag with each of the New Minis~Mini Fhiona and Her Friend Penguin, Mini Skating Fun Fhiona, Mini Tabogganing Ellie, and Mini Santa Fhinn. I used a mix of My Mind's Eye 12 Days of Christmas dp, MFT Die-namics Decorative Doily Duo, PTI Tiny Tags, Ribbon, and Rustic Button Twine. Don't they make an adorable set?! Snowflake Border Stamp is only $2.00~while supplies last! Also, don't forget to check out the YNS Blog for special giveaways and to find out which other DT members are showing off some of the new images today:) Thank you so much for stopping by and have a fabulous Friday! I ADORE these tags, SOOOO cute! Now I want all the mini's to make tags! I have missed you too girl! Hope everything is going well and you are feeling better. Kerri, these are so cute! Beautiful coloring like always! These tags are SO ADORABLE!!! I always love your fabby tags Kerri!!! 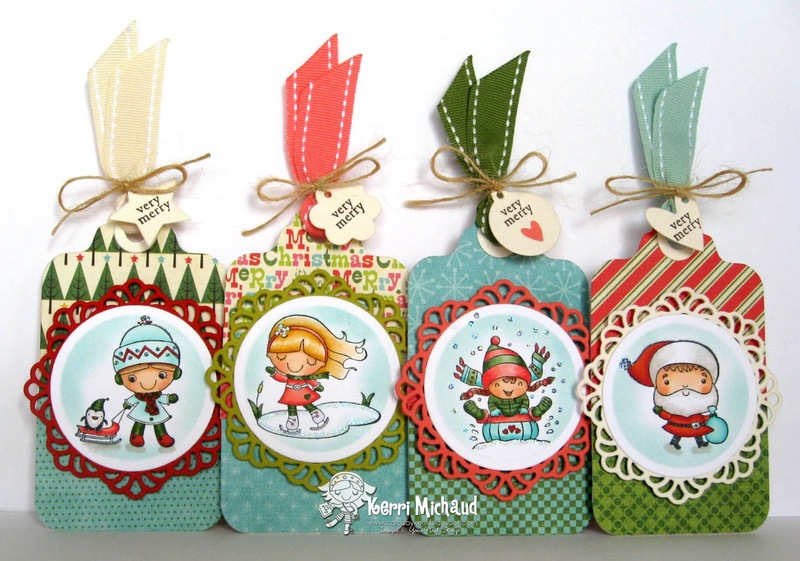 What a cute tags Kerri, the stamps are so sweet, wonderful job! These are all so darling! !